Title: Tabula Europae Prima. Publication: Geographiae universae tum veteris, tum novae absolutissimum opus... Auctore eodem Io. Anto. Magino Patavino..., Cologne 1597, Petrus Keschedt. 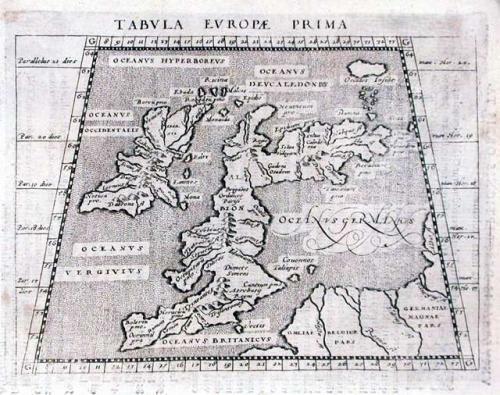 A Ptolemaic map of ancient Britain showing the misconception of Scotland orientated east-west. Based on the 1561 Valgrisi edition. Text on verso. Stain in top right corner well away from plate mark. Light toning.